Argentina and Bolivia have many things in common, just enough to go around many streets in Bolivia to notice the great influence between two countries, comic books, food, football, music... well, I can't find another country with which Bolivia has such an affinity. Interestingly, the news about the "nationalization" of YPF (in Argentina) brings us together once again. One of the reasons because I decided to study a little more about this issue (the "nationalization" of YPF) is because the commercial relationship between Bolivia and Argentina, in particular, I want to know: 1) what is happening in the oil market in Argentina to send a signal of such magnitude and; 2) how it could affect to Bolivia. In this sense and tanking the risk of give opinion about a country which is not mine, I will begin this text reviewing some official statistics (link). In principle we'll see the natural gas production level in Argentina, the following graph shows something well known in the region, the not growing (yes, no growing) gas production. However, discriminating production among those volumes from YPF and those from other companies things become more interesting. During 2009 - 2010 period both productions "went hand in hand". However, from the second half of 2011 things changed. 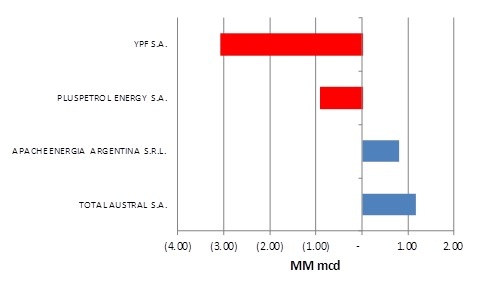 Note how the production of other companies in Argentina reverses trend and increase production more than 3 million cmd (approximately 50% of imports from Bolivia to Argentina) which is clearly not the case with YPF. 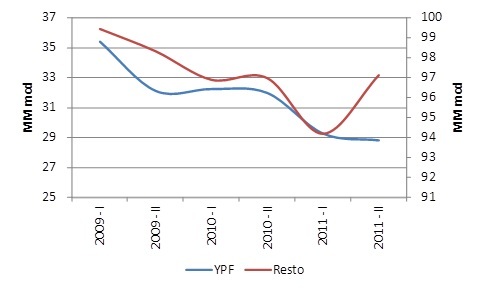 The reasons to have YPF in such a situation (productive I mean) are many, and will be subject to ample justification (I think that the reality is far from political discourse), but let me focus on companies that "did their homework", those companies that improved their production levels between 2010 - 2011. For that reason I present the following chart, where you can observe the "two sides of the coin" in red those companies with decreasing production and in blue the other ones. And here the first question arises: who will administer YPF fields? The simple answer for sure is the "state enterprise ENARSA" then the second question is, will be alone? "Total Austral participated in a tender launched by the province of Neuquén, achieving two of the ten blocks of land offered in which exploration work will be taken forward focus on shale gas." (link). Aha!... couldn't be otherwise, new technologies that are revolutionizing the world, started knocking regions doors, since Argentina has one of the more interesting prospects with shale gas. For the curious reader, I also invite you to review the operations of the company SINOPEC in the neighboring country, you will have more than a surprise. How could this affect Bolivia? A sentence from current President, Cristina Fernandez de Kirchner, nicely summarizes my perspective on this: "The primary objective is the attainment self-sufficiency in oil." It reviewing the statements of President (link) (when announced the decision on YPF) at the beginning of her speech she indicated her concern about the rising cost of energy imports, naturally the Bolivian gas is part of this imports. So, dear reader, the long-term signal is clear, the major goal in Argentina is get energy self-sufficiency, where new technologies (shale gas) are a key extraction. In such a context, I wonder what is the space left for Bolivia to increase natural gas sales to Argentina? The signals from the oil market in the world are simple... all point to new technologies and companies that do not evolve with the market will have serious problems in the future. La Paz, April 17, 2012.